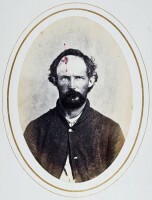 Civil war portraiture of surgeon Reed Bontecou at Harewood Army Hospital, Washington, D.C., 1865 from the Burns Collection. 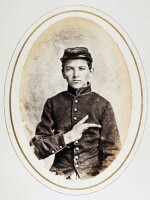 Reed Bontecou was responsible for pioneering, and taking, the largest number of photographs of wounded soldiers during the Civil War and was the single largest contributor of photographs and specimens to the Army Medical Museum and medical publications of the time. 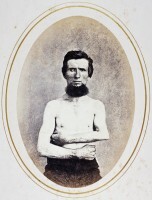 His close up images of surgery, anesthesia, and patients posing with their pathological specimens were unique to his time. 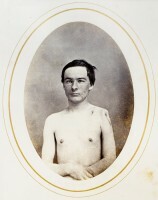 Many photographs are of patients pre- and post- operation, views of patients showing the progression of specific treatments, or the various stages of diseases. 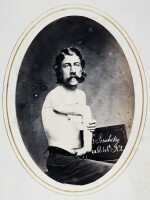 After the war he organized his photographs into albums laying them out, anatomically from head to foot wounds, and loosely alphabetically by soldier’s name. Bontecou’s images are beautifully posed, and the sitters seem almost serene in his gaze, elevating clinical photography to an art form. They speak a universal language of war, or rather, what it can do in human terms. Bontecou was a master of exposing the nature of the sitter. 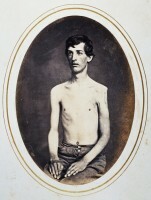 Beyond the wounds, the amputations, and the gangrene, the subject is presented as naturally as possible. It should be noted that smiling in photographs during this early period was very rare and the subject put on his best expression. Some images are further enhanced by Bontecou’s own red pen, detailing the trajectory of the bullet that impacted on the patient. 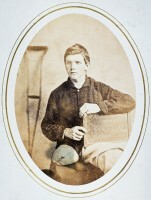 These images, with the hand drawn lines, were part of his personal Harewood Hospital teaching album.